LOS ANGELES — About 2 miles out from Cabrillo Beach lies one of San Pedro’s oldest and most neglected icons. Since 1913, the Romanesque-style Angels Gate Lighthouse has stood watch at the entrance to Los Angeles Harbor, and is currently in the midst of some much-needed renovation. With its last touchup done in 1989, the 98-year-old steel and wood structure was really beginning to show its age. “The lighthouse has been in need of some form of refurbishment over the last 15 or 20 years,” said Gary Dwight, president of Cabrillo Beach Boosters — the club in charge of the $1.8 million revitalization. Dwight said the Coast Guard was contemplating tearing down the lighthouse and installing an A-frame building to replace it before Joe Radisich Sr. — father of former Los Angeles Harbor Commissioner Joseph Radisich Jr. — contacted the club to help raise funds for the lighthouse. “Joe was the one who originally saw that this was something that needed to be done — and when others had failed, he brought it to the Boosters; and we were able to raise the money,” Dwight said. Angels Gate, one of three lighthouses dotting the South Bay coastline, is the least celebrated in the region. The Point Fermin and Point Vicente lighthouses are both surrounded by picturesque parks atop beautiful cliffs, are easily accessible to tourists and are easily viewable, as well. With its location nearly 2 miles out at the edge of the San Pedro breakwater, Angels Gate Lighthouse has a coat of rust at its base — not a park. In his youth, Dwight spent summers with friends scampering along the rocky passage toward the octagon-shaped steel structure, fishing and diving for abalone along the way. Today, the breakwater is off-limits to the public, and a chain-link fence guards the now unmanned lighthouse. The five-story tower was once operated by a four-man Coast Guard crew, but it was updated and automated in 1973. A green flash is emitted from the lighthouse to aid vessels entering the harbor, and it is easily distinguishable from the area’s surrounding white lights. Years of pounding seas and abrasive salt-soaked winds have had a visible effect on the tower, and the renovation is something the port officials are happy to see. Construction equipment and containers began being barged and taxied out to the lighthouse by U.S. Water Taxi in September, and scaffolding was put in place along the structure’s rusted walls. After sandblasting, the lighthouse’s damaged steel siding will be replaced. The exterior will be “hot zinced” before a new coat of paint is applied. The containers have been strapped to the breakwater as a precautionary measure, to avoid what happened during the lighthouse’s last repaint: A storm knocked a container off the breakwall and into the water. Dwight said it took more than two years to get the project to the construction phase, with multiple permits and fundraising required. The nonprofit organization took the project to the Port of Los Angeles’s community subcommittees in both San Pedro and Wilmington. Cabrillo Beach Boosters asked for money from both cities for the lighthouse repair, hoping that both would be willing to set aside a portion of the China Holding Shipping Co. settlement funds the communities were awarded after a lawsuit involving the harbor department and the Natural Resources Defense Council in 2003. The expansion of the Chinese Shipping terminal led to the lawsuit, when concerns were raised citing insufficient research conducted by the port on the effects the terminal would have on the surrounding areas. 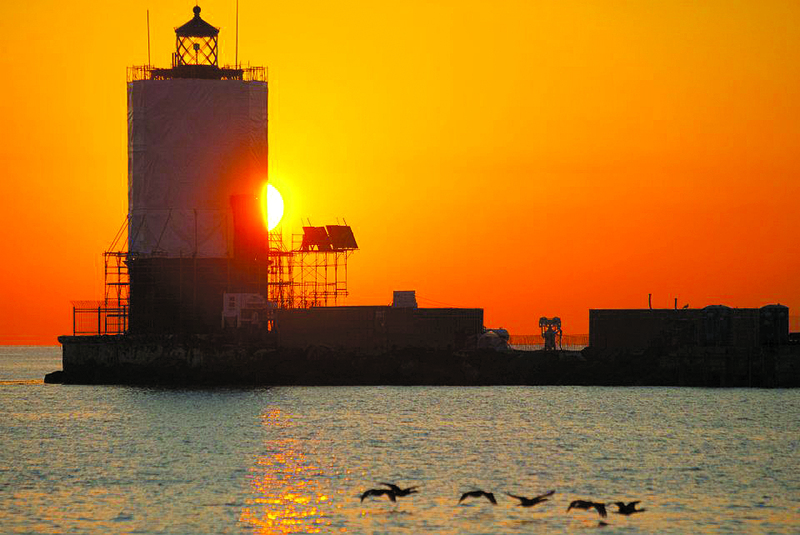 While San Pedro passed on allocating funds for the lighthouse renovation, Wilmington Waterfront Redevelopment subcommittee chairman Ken Melendez saw the project as not just a lighthouse revamp, but as a way to highlight the entrance of Los Angeles from the water. “The Wilmington Working Group recommended this project, because we believe we are one harbor, one community — and we believe this project can be delivered in a timely manner by the Cabrillo Beach Boosters, on budget,” Melendez said. With the $1.8 million awarded in 2010, the process toward construction work began. As construction continues on the exterior, Cabrillo Beach Boosters are busy planning a reconstruction of the Angels Gate Lighthouse interior, requesting bids to begin work on a project estimated to cost $400,000.